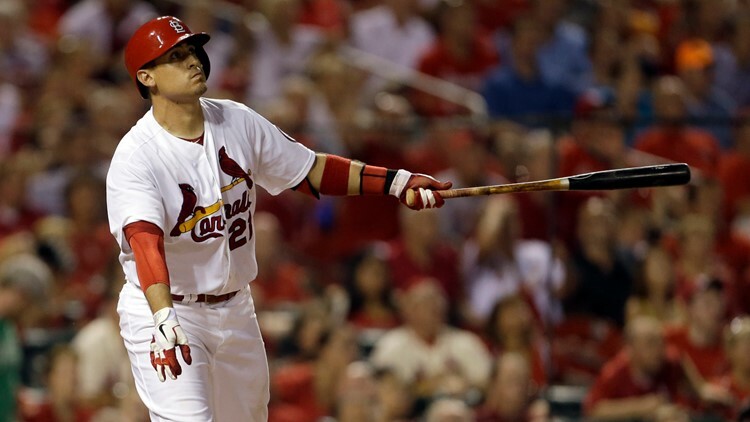 Allen Craig should be ripping baseballs all over the diamond, possibly for the St. Louis Cardinals. He was the perfect player. The effortless stroke at the plate, the versatility in the field, and the ability to rise to the occasion. For three years back in 2011-13, Craig was a hitting machine. I'm talking about a slash line of .310/.360/.495 with pop and consistency. After a small taste of the pie in 2010, Craig came into power in 2011 with the Cardinals, playing outfield, infield, or whatever was needed. The cheap everyman with a sweet swing. He wasn't appreciated by National media, but he was beloved in St. Louis, even if the adoration wasn't as full as the other guy. With David Freese passing through town this week on potentially the final time, Allen Craig retired from baseball. After a three season struggle at the plate following a terrible bout with plantar fasciitis, a foot injury that can plague a career, Craig was done trying. Since there is only one Rick Ankiel, you won't see Craig try to transition to pitching. He will take a position in the front office with the San Diego Padres, the team he finished his career with. It's a sad end to the career of a guy who once was an RBI machine for the team. In 2012, Craig's batting average with runners in scoring position was lethal, finishing the season at .400. The rampage with runners on continued into 2013, which ended with Craig injuring his foot. He was doubtful for the playoffs, collecting 16 at-bats in the World Series against Boston, which included the fateful collapse/collision at third base and home plate. A play that won the Cardinals Game 2 but may have cost Craig a career. He was never the same. Craig's batting average in 2013 was .315. That would be his slugging percentage in 2014 with the Cardinals before he was traded to Boston. He would accumulate 65 games and 173 at-bats with the Red Sox before making a last-ditch attempt with San Diego in spring training. It didn't work out, and Craig hung them up today. Good for him. Some players drive their minds crazy until their bodies wear out. They chase some invisible goal into oblivion. Craig is better than that. After all, he retires with a World Series ring and some stellar playoff stats. While Freese is celebrated, rightfully so, for his 2011 heroics, Craig went 5-19 against the Texas Rangers in the World Series with three home runs and four walks, including a game-winning solo home run in Game 7 to put the Cardinals ahead for good, 3-2. He caught the final out in left field to seal the win. In the memorable Game 6, Craig homered to trim the deficit to 7-5. He was the epitome of clutch. More often than not, sports don't produce happy endings. Players come on strong, die off, and drift away. Craig came on strong, made a mark, suffered an unfortunate injury, yet leaves with his head held high. Sadly, Cardinal Nation won't be able to give Craig a curtain call in a return with another team. They'll have to appreciate him in their homes, lost in their own memories of 2011-13. The 2-out hits. The home runs. The RBI machine that never lost oil. Craig just kept hitting. He will retire with a respectable slash line of .276/.333/.435. Here's the stat line to remember. In 565 career plate appearances with runners in scoring position, Craig slashed .341/.411/.542 with 21 of his career 59 home runs. Clutch gets thrown around a lot with professional athletes; Craig owns a piece of the trademark there. Will he get a red jacket in a few years? No. Craig didn't do enough in St. Louis to accomplish the same spot as Bob Gibson, Chris Carpenter, and Jim Edmonds. What he did accomplish holds plenty of weight and should be appreciated greatly by Cardinals fans. As you cook out on the patio this weekend, raise a glass to Allen Craig, an underrated Cardinal gem. It wasn't supposed to end this way, but he should leave the field with his arms raised high.